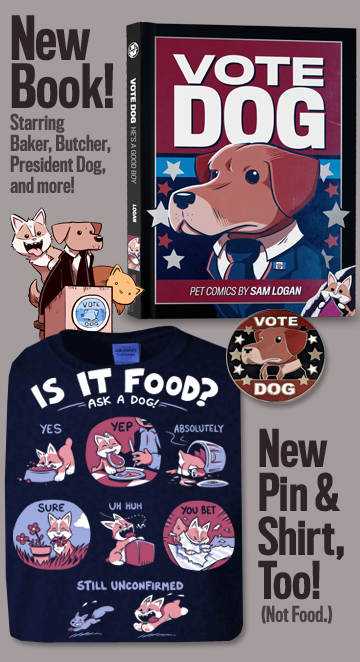 Two thousand Sam and Fuzzy updates! On this momentous occassion, I'd just like to say: sorry about that one that was a day late. In my defense, I had appendicitis. Seriously though. 2000! That seems like as good an arbitary number to celebrate as any. It's certainly a lot more than I ever thought I'd do when I uploaded the first one. And of course, I'd never have been able to do it without all your support. Thanks for sticking with me, team! Sam, as you will recall, has always been a little skeptical about the pit. No, I did! You're right: there are, and always have been, 33 members. I don't know why my brain always wants to default to the number 35. EDIT: Wait, no! There are 31 members, not 33. So I guess neither of us can count! HA! Well, to be honest, it'd be the people at [adult swim] or Netflix that would need to do the considering! 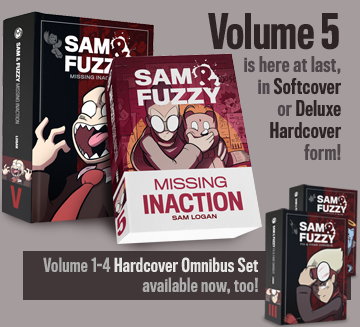 But no, no one has ever approached me about developing a Sam and Fuzzy TV series, and I've never really pursued it on my own. It'd be an interesting project to adapt! A lot of Sam and Fuzzy's plots and mysteries are the kind of thing that wouldn't work as well in animation as in print -- for example, if you could have heard Crush's voice, his identity would have never been a mystery! I've always felt like, if I got the chance to develop an animated series, I'd be more inclined to create something new than to retrofit Sam and Fuzzy into that format. But it's all pretty hypothetical at this point!